We started out at noon today after "sleeping in" (it is Sunday after all) and cleaning up the lodge. We were headed out to Slough (pronounced slew like stew) Creek and the Specimen area to look for Alyssum desertorum. Using GPS data from the Univ. 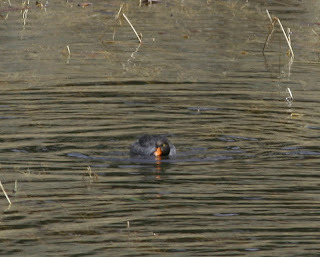 of Montana we had waypoints to check that had previously identified ALDE's presence. On our way out we passed a bison kill that was 10 feet off the road near Specimen, nothing was eating it but plenty of photographers were waiting for an animal to return (When we came back through the carcass was loaded on a truck to go to the carcass dump, not safe that close to the road). The hike down the Slough Creek was nice, no ALDE, but we did see plenty of Bison a few ducks and coots and some fresh bear tracks (a little unnerving) but hiking with 7 provides safety in numbers and we had our bear spray. Slough creek is one of (if not the most, Eric?) species rich area in Yellowstone. It is my favorite place to hike. Although it can be hiked on a gravel road it gets you off of the beaten path somewhat and you can hear nature. We even heard the spring peepers today. Just can't stop taking pictures of bison. 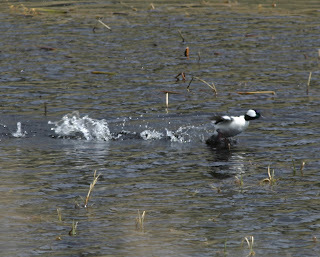 Above is a Bufflehead duck that was being harrassed by a Barrows Goldeneye duck (Below). So after we finished the Slough Creek hike we headed back towards Specimen to find an ALDE waypoint. Nearly to the destination we see a load of RV's, cars and spotting scopes. 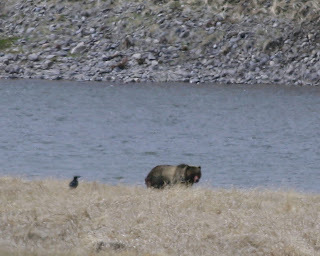 We happened upon a grizzly eating an unknown (to us) kill on the Lamar river. 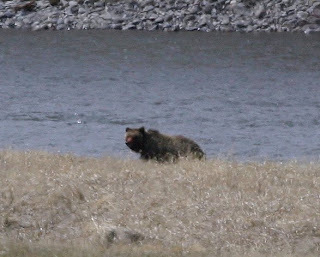 The waypoint we were looking for turned out to be on the river bank and probably 1/4 mile from the grizzly so we didn't look for ALDE, but we got great pictures and video, once again. We are really fortunate. Seven wolves and 2 grizzlies on three different kills, all within 3 days. Tomorrow we will be conducting another lab incubation of soils with simulated bovine urine and an inhbitor of urease. Plus we will be going out to quantify soil respiration in the field and sample soil in the restoration site prior to seeding (which may occur this week). I look forward to each new addition to your blog. What a treat! The dinner music with the wovles dining on bison was a nice touch. 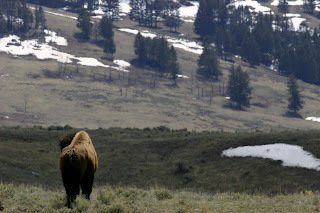 Don't you think you need to extend your trip in YNP where you are safe among the bears and wolves rather than go back to W&L where there is the dreaded flu?